Our classmate Kathi Kincel has established a creative writing scholarship in memory of her twin sister, Karen, who passed away last summer on July 26, 2014. 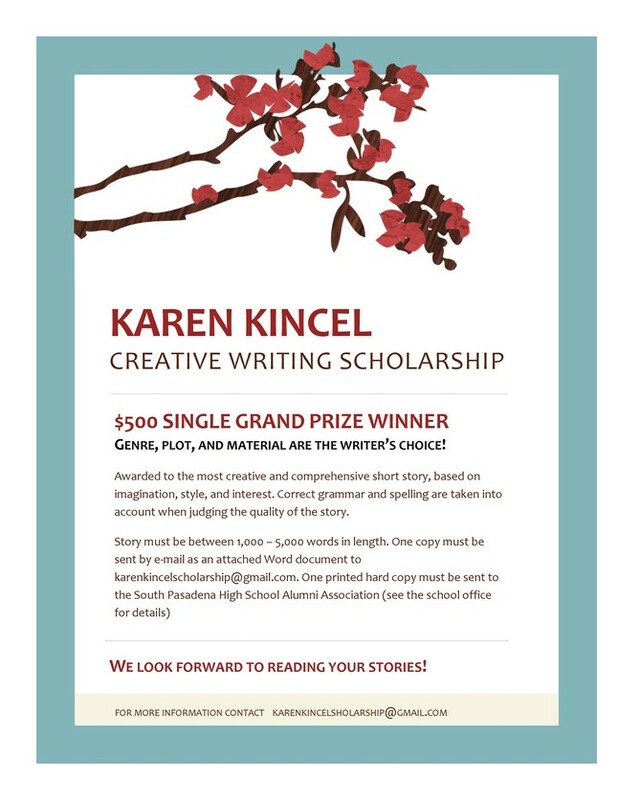 The Karen Kincel Creative Writing Scholarship will assist a South Pasadena High School graduate to be able to pursue a college education. SPHS seniors will be invited to submit short stories consisting of 1,000 to 5,000 words, and the award will be presented to the author of the most creative and comprehensive short story, based on imagination, style, and interest. If you are interested in supporting this tribute to Karen, you may make contributions payable to the South Pasadena High School Alumni Association (or "SPHSAA"), c/o Karen Kincel Scholarship, PO Box 1219, South Pasadena, CA 91031-1219. Be sure to write "Karen Kincel Scholarship" in the memo section of your check.